BLUFFTON, S.C. (CNS) — When Jennifer Bermejo was growing up in Aguascalientes, Mexico, her family celebrated Dia de los Muertos, or Day of the Dead, every year. Bermejo, assistant for Hispanic ministry at St. Gregory the Great Church in Bluffton, recalls it as a fusion of culture and religion, noting that her family and neighbors always attended Mass to pray for their deceased loved ones. 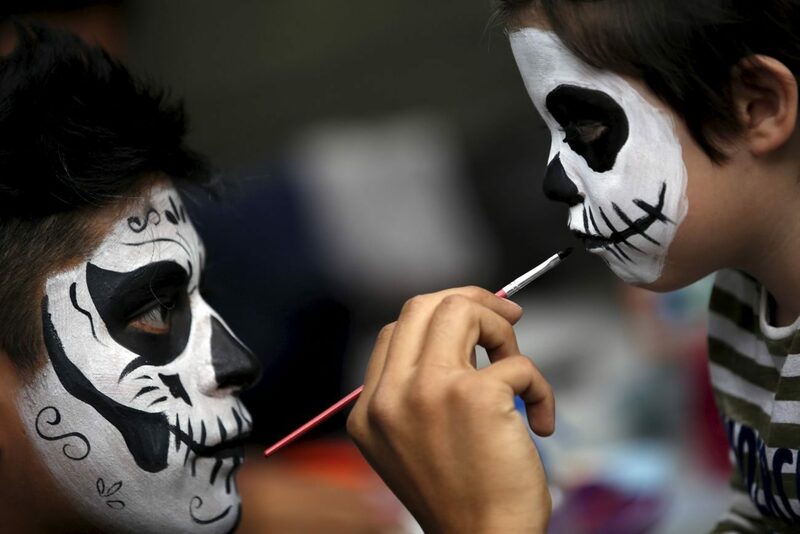 Afterward, everyone joined together for La Catrina parades and gathered in cemeteries, where they continued to offer prayers but also reminisced and paid tribute to their family through song, skits, and favorite foods and drink. Dia de los Muertos begins at midnight Oct. 31, when it is said that the gates of heaven open and the spirits of the little children (“angelitos”) are allowed to reunite with their families for 24 hours. This is Dia de los Inocentes, the Day of the Innocents, and coincides with All Saints’ Day. The following day, Nov. 2, is the actual Day of the Dead. It also is All Souls’ Day. Bermejo said that for her family, the tradition of Dia de los Muertos fell away when they moved to Bluffton in 2005, because they have no cemetery or relatives to visit here. This year, however, she was bringing some of those cultural aspects to St. Gregory Oct. 31, having the children dress as their favorite saints and participate in Day of the Dead traditions such as painting sugar skulls in bright colors. “We’re showing them that the day is about praying for family members who have passed away and remembering them,” Bermejo told The Catholic Miscellany, newspaper of the Diocese of Charleston. The purpose of both Dia de los Inocentes and Dia de los Muertos is to remember the dead and pray for their souls in purgatory, to help them atone for their sins and move into the presence of Christ. Dia de los Muertos evolved in Mexico from the rituals of Aztecs and Mayans. When the Spanish arrived, indigenous beliefs and Catholic religious practices merged, combining for a mix of somber celebration in homes and churches, and more lively festivities in secular spaces. Bermejo said the heart of each day centers on prayer, but there are cultural traditions unique to Dia de los Muertos. One of the most important aspects in Mexico is the creation of altars in homes in honor of deceased family members. The displays range from one to seven levels; from simple to extravagant. They are decorated with a cross, candles, and tissue paper cutouts, and filled with objects meant to draw the spirit of the loved one, such as photos, personal objects, and favorite foods. Bright orange flowers, “cempasuchil,” are placed all around the altars and in the cemeteries. A type of marigold, the blossoms are said to guide the spirits with their vibrant colors and scent. Another custom are the sugar skulls. They have become so popular that they have evolved into an art form for tattoo artists. People have images of their loved ones inked in elaborate sugar skull designs, in honor of the deceased and in hopes it will bring their blessings. Pan de Muerto, or Bread of the Dead, also is placed at altars and cemeteries. Traditional loaves have a crust shaped into crossed bones, but Bermejo said her family and others also shape the crust into a cross to represent Christ. Another aspect that has spread far beyond Mexico is La Calavera Catrina, first created between 1910 and 1913. Bermejo said the artist, Jose Guadalupe Posada, is from her hometown and the Catrina parade is a huge affair that draws artists and participants from all over. People walk in parades to the cemetery, where they often spend the day and night. Prior to the celebration, people spend time cleaning, repairing and decorating the grave site. While there is prayer and reciting the rosary, time at the grave also celebrates the living memory of the deceased, and gatherings become family picnics, with food, drink, music, flowers and even fireworks. Taylor is a reporter at The Catholic Miscellany, newspaper of the Diocese of Charleston.